Scroll Down and Click on Picture to see Available Homes & Resorts. Aloha! Emmalani Court is an upscale, very clean complex located in resort community of Princeville on Kauais North Shore. The Kuhio Shores sits right on the edge of the ocean! An expanse of blue Pacific is what fills your view. Enjoy the sounds of the surf, whale watching and sunsets. 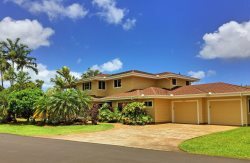 Mauna Kai condominiums are large and great for families and situated close to the shopping and dining in the Princeville Center. The pool is one of the largest in the area. Poipu Makai is a Boutique resort with unobstructed views of the Pacific Ocean and cooling tradewinds. You are just around the corner from the best beaches and restaurants Poipu has to offer. Waipouli Beach Resort & Spa is a luxury beachfront resort located on the east side of the island of Kauai.